14th Lanchester Boys’ Brigade in conjunction with Croft View Halls and other organisations is aiming to produce over 2,500 poppies and display them on the lawns in front and up the side of Lanchester Methodist Church during October and November 2018 to commemorate the 100th anniversary of the end of World War One. This will be similar to the poppies around the moat at the Tower of London but on a much smaller scale. 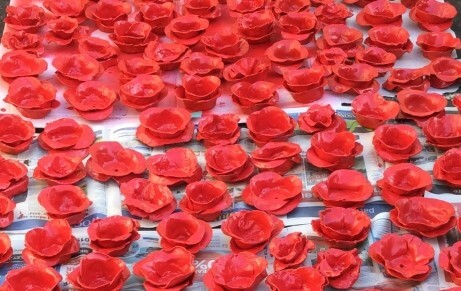 The poppies are individually made of air dry clay, and gloss painted red. We intend to personalise some of the poppies with a dog tag showing the name of a fallen solider from any war or indeed with a name that someone may just want to remember. A charge of £10 will be made for these poppies, they will form part of the display and at the end of November 2018 the person who ordered the poppy will get to keep it together with the tag and a certificate confirming it has been part of the display. All the poppies without a dog tag will be sold at the end of the display for £5 each. We are having workdays every two months when everyone interested can come and participate in the project either making or painting poppies or just to see what it is all about. Several organisations are already involved including, the WI, all three churches in the village, Guides, Brownies, Rainbows, St Bede’s school, Croft Court residents, Sewing Bees, Wednesday sewing group, Methodist Sunday school, Boys’ Brigade, Monday Art Class and many very enthusiastic residents who all want to be part of this project.